Protein is an essential nutrient, helping with brain function and overall body support. When people think of protein, they typically think of meat because that is one of the most common sources for many people in the United States. The emphasis on the importance of eating meat in our society has created a general idea that finding protein if you don’t eat meat is difficult, and maybe even impossible. For many years, there has been an idea that we have to consume many different varieties of food to get the right amount of protein in our body. The idea isn’t exactly wrong, but it is misguided, and not nearly as important as people once believed it was. Not only are there plenty of different plant-based proteins, eating enough protein is not as daunting as it sometimes feels to people who are new to it. When people are first looking into the vegan lifestyle, they often worry about there are not enough protein sources, and they worry they won’t find protein they will love as much as meat. The truth is that there are many vegan sources of protein and with a little research, you can find protein sources that taste great. One of the first steps you need to take to find better protein options is to let go of the images of the perfect dinner plate you were taught. From a young age, most kids are taught that the perfect dinner plate must contain a 6-ounce piece of meat, vegetables, and a starch. Food allergies, lifestyle decisions, and personal preferences have challenged the idea of the perfect dinner plate. It is true that you should aim for a colorful plate of food, but what is not true is the idea that the perfect dinner plate must contain meat, starches, and veggies. You can eat the protein you need at any point in the day, for snacks or meals. Your body needs protein, but it doesn’t require it at a specific time. You don’t have to eat large amounts of protein at meals, and then avoid them during other times. Your body is designed to discard protein that is not needed, which means overeating protein doesn’t serve you well in the long run. The best time to have protein is in the morning because it helps regulate your blood sugar. After that, consuming protein in smaller increments through the day helps ensure your body gets what it needs without discarding too much. If you are looking for different plant-based protein options, here are ten different vegan protein sources to try. Lentils are an excellent source of protein with around 18 grams in each cooked cup. Not only are lentils a good protein source, but they also have several other excellent health benefits. A cup of lentils contains around 50 percent of the fiber you need in a day, and that type of fiber promotes a healthy gut by feeding the good bacteria located in your colon. Lentils are also packed with manganese, iron, folate, and antioxidants. Lentils are also being researched for their ability to help people lose weight and fight against heart disease and some cancers. While seitan is an absolute no-go for people with celiac or gluten sensitivity, it is a good source of protein for many vegans. Seitan is made from gluten and resembles the texture and look of meat when it is cooked. Every 3.5 ounces contains around 25 grams of protein which makes it one of the top sources of plant protein. Besides protein, seitan also has some iron, phosphorus, and calcium, along with selenium. People who enjoy seitan can either purchase it at health food stores or make it on their own. One of the best things about seitan is that it can be prepared in many different ways and is a great meat replacement. Whether you want to grill it, pan-fry it, or sauté it, seitan can be used in many different recipes. Another excellent vegan protein source is beans and legumes. 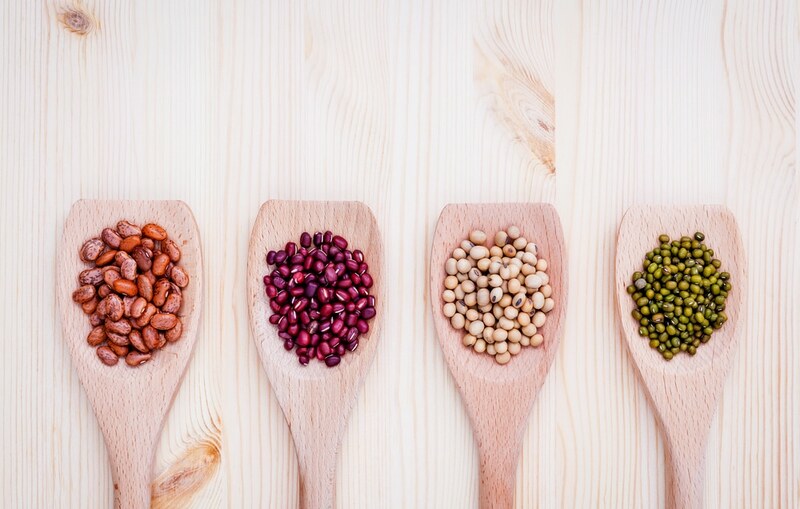 Black, kidney, pinto, and most other types of beans provide reasonable amounts of protein in each serving. Chickpeas, which are also known as garbanzo beans, are a legume that have a large amount of protein per serving. Most beans and legumes contain around 15 grams of protein in each cooked cup. They are also good sources of fiber, folate, complex carbs, iron, potassium, phosphorus, and manganese. Beans and legumes are excellent sources of protein that can also help lower blood pressure and cholesterol and help regulate blood sugar levels. Whether you want to make chili, hummus, or roasted chickpeas, legumes and beans are packed with a lot of nutrients, and plenty of protein. Quinoa and amaranth are often grouped with other ancient grains, but because they don’t grow from grasses like the other grains, they are technically a pseudocereal. Both quinoa and amaranth can be ground into flour or served as a side. A serving size of one cooked cup provides around 8 grams of protein. Not only are they a great source of fiber, complex carbs, iron, manganese, magnesium, and phosphorus, they are also a complete source of protein. Oatmeal is one of the best vegan protein sources. Compared to brown rice, it has three times the protein, more fiber, and less starch. Oatmeal is also packed with calcium, magnesium, and plenty of the B vitamins you need. While many people eat oatmeal as a hot cereal, there are many other ways to prepare it such as blended into smoothies or cooked into savory dishes. While all fruits and vegetables do contain some protein, in many fruits and vegetables the amount is small. If you want to focus on plant protein, eating the fruits and vegetables with the most protein is a great idea. The two vegetables with the highest protein content are artichokes and green peas. Artichoke hearts have around 8 grams of protein per cup. They are also a great source of fiber which makes them filling, yet low in calories. They are excellent on salads, in sandwiches, roasted and topped with your favorite nut cheese. Peas are also a great source of fiber and protein. Like artichokes, every cup of peas contains around 8 grams of protein. They also provide leucine, an amino acid your body needs for metabolism regulation that is not carried in many plant foods. Peas are an excellent side for meals, but also a great snack during the day. Other vegetables with protein include broccoli, asparagus, spinach, potatoes, brussels sprouts, and sweet potatoes have around 4-5 grams of protein in each cooked cup. Sweet corn, technically a grain, also has about the same amount of protein. There aren’t fruits that contain as much protein as vegetables, but they can still be a good source of protein. The fruits with the highest amounts of protein include guava, mulberries, cherimoyas, nectarines, blackberries, and bananas. Each cup has about 2-4 grams of protein. Not only do fruits and vegetables make a filling snack, but plant protein is also preferred by many because it is a healthy source of necessary nutrients. Nut butters are a good vegan protein source, and there are several to choose from. Peanut butter, cashew butter, and almond butter are some of the most common. Natural nut butters can provide a healthy snack without oil and sugar additives. Just a couple of tablespoons of nut butter can provide you with up to 8 grams of protein. One of the most common meat replacements for vegans is tofu. It is a flavorless soybean mix that can be flavored however you want. For every cup of tofu, you are getting 10 grams of protein. Learning to cook with tofu is worth your time because the end result is an excellent vegan protein source that can enhance most of your dishes. Like tofu, tempeh is also made from soybeans. However, it is made from fermented soy and is a favorite vegan protein source because it has 12 grams of protein in every cup, plus it is filled with probiotics. Chia seeds are a good vegan protein source because there are 5 grams of protein in just two tablespoons of seeds. They are also a complete protein source. While protein is an essential nutrient, people are mistaken when they believe they have to eat meat to get an adequate amount. There are plenty of vegan protein sources available, and with a little research and practice, you can get plenty of protein from plants, seeds, beans, legumes, vegetables, fruits, and more.